Boys basketball runs immediately following the November Reading Week and concludes before Spring Break in March. Teams range across Grades 7-12, with 'Varsity' and 'Junior Varsity' teams allowing every boy the opportunity to participate and play. Every year all Upper School boys teams compete in their respective ISAA (Gr. 8-12) or ISEA (Gr. 7) Championships against other Independent Schools across the Lower Mainland and Vancouver Island. Gr. 8-12 teams participate in North Shore Leagues against schools from West Vancouver, North Vancouver and the Sunshine Coast, while our 'B' teams compete in GVISAA. Every March the Varsity Team aspires to qualify for Double 'AA' Provincials. 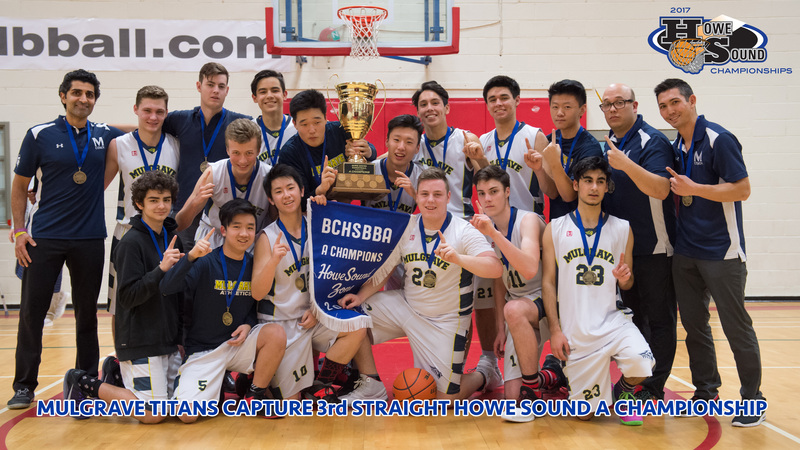 The Varsity Team has won and represented the Howe Sound Zone at Single 'A' Provincials for three straight years (2015 to 2017- pictured below) and has placed as high as 4th (2007) and 10th (2006) in past Single 'A' Provincial Championships. Every second year the Varsity Boys travel to Hawaii to participate in the World Youth Basketball Tournament in Kona. Girls basketball runs immediately following the November Reading Week and concludes before Spring Break in March. Teams range across Grades 7-12, with 'Varsity' and 'Junior Varsity' teams allowing every girl the opportunity to participate and play. Gr. 8-12 teams participate in North Shore Leagues against schools from West Vancouver, North Vancouver and the Sunshine Coast. Every year all Upper School girls teams compete in their respective ISAA (Gr. 8-12) or ISEA (Gr. 7) Championships against other Independent Schools across the Lower Mainland and Vancouver Island. Every March the Varsity Team aspires to qualify for Double 'AA' Provincials. The Varsity Team has won and represented the Lower Mainland Zone at Single 'A' Provincials the last ten years (2009-2018) and has placed as high as 2nd (2015, 2017), 4th (2016, 2018) and 5th (2014) in past Single 'A' Provincial Championships. Every second year the Varsity Girls travel to Hawaii to participate in the World Youth Basketball Tournament in Kona, placing Fouth in their last two trips in 2017 and 2015.